Sportsman’s Guide®, a successful internet/ecommerce retailer based in South St. Paul, Minnesota, has been providing hunters and outdoor enthusiasts with quality gear and clothing at exceptional values since 1976. 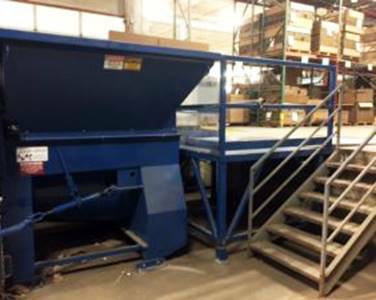 Growing sales and a commitment to consistently adding new products to their assortment keeps the Sportsman’s Guide warehouse buzzing with activity, creating a need for reliable, cost-effective compact recycling. The Sani-Tech Auger Compactor, Model ST1546/46, meets their needs on a daily basis, and has proven its worth by decreasing their previous daily hauls to just one or two a week! We’re proud to provide an environmentally friendly, small footprint machine for this community conscious retailer. Sportsman’s Guide proudly supports and participates in programs benefitting those in need, and with the help of our dealer at American Services and DMH companies, we’re delighted to further their productivity with smart, efficient waste solutions.